Posted on 27 March 2007. What do you get when you combine 48 extraordinary gift baskets, 61 dozen eggs, 58 pounds of pancake mix and over four hundred people? 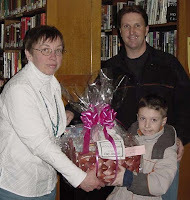 The result was a very successful Flapjacks and Fairytales pancake breakfast and theme basket raffle to benefit St. Johnsville’s Margaret Reaney Memorial Library. Coordinated by library trustee Lois Thomas, last Sunday’s event included not only breakfast and baskets, but also face painting and storytelling for children and musical entertainment featuring guitarist Pat Clark and violinist Leo Milman. Bob and Judy Fisher directed the cooking and serving, heading up an enthusiastic team of about twenty volunteers and library trustees. Starting at 8 AM, flapjacks were flipped without pause until all were fed. Trustee Thomas expressed the board’s gratitude for the wonderful show of support and thanked everyone for their attendance and participation. Plans are already underway for next year’s gala.